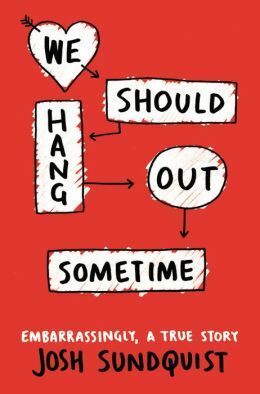 Next Tuesday, a fantastic new books hits the shelves: We Should Hang Out Sometime’ by Josh Sundquist, a brutally honest look at dating. It’s one of the Advance Reader Copies I was given at BookCon, and I admit that this review was published on my old blog (which no one needs to see.) But seeing as how the wait is finally over, I thought it best to share it with you all here. The book itself is a memoir of the author’s experiences as a teenager/Young adult, chronicling his attempts (and failures) at finding a girlfriend. According to the author himself, it is a ‘semiscientific, wholly hilarious investigation’ into what went wrong in his pursuits of love. And by semiscientific, he means he forms hypotheses, investigates, tracks those women down, and asks them point blank why it never worked out between them. I love the scientific approach to understanding where the relationships went wrong, as it ads to the charm of the book. And there are charts. Very funny, very accurate charts, drawn in sharpie, placed here and there all throughout the novel, giving you insight into the author’s mind and a good laugh (or a sincere awww) in most cases. The story itself is so brutally honest that I can’t help but feel connected to the life of young Josh, and the challenges he faces trying to find a girlfriend. It’s incredibly engaging. The reader finds themselves relating to his thoughts and feelings as he comes up against the challenges of finding love. The fear of rejection is a poignant reoccurring theme throughout the entire novel, which both holds him back from asking out the women he crushes on and taints his memory of the relationship, which we can se through the hypotheses he forms about why it never worked out between them. “She may have liked me, but…” is a repeated consideration of the author with almost each of the potentials. And it doesn’t help that he does get rejected right off the bat one of the only times he does go for it. The book is an incredibly quick read, both because the author manages to convey some of the key concepts through well thought out charts, and also because the reader just simply wants to know what’s coming next. I sat down and read the book in less three hours, on the bus on the way from BookCon to Philly. It reads like you’re sitting with a friend and he’s telling you his worst dating experiences. It’s engrossing, captivating, grabbing the reader and making them a participant in the investigation. It has some real laugh out loud moments, and I found myself laughing not only because of the absurdity of his predicament, but also because of how much I related to what he was feeling. But the truth is, the book isn’t just about finding a girlfriend, finding love; it’s about our own insecurities, fears, our self esteem. It’s about you. It’s about all of us, because we can all relate to these, even if we aren’t missing a leg. This book isn’t just about finding love in others, but learning to love yourself. Josh begins the book by stating that the reason behind his investigation, other than curiosity, is to find out what was wrong with him, if it was something like annoying habit, that he could change, or something permanent, that he would just have to live with. Each time, he asks what was wrong with him. And, SPOILER ALERT! Nothing is. The problem is that he believes there is. Which is why I’d recommend this book to anyone and everyone who’s ever felt that deep set feeling that they’re just not good enough. Everyone can relate to Josh’s struggles. Everyone has felt insecure, for different reasons: maybe we didn’t even realize it at the time. I really recommend this book. It’s a fantastically fun read that I’d happily share with others, and it offers a fantastic lesson – a truth – without being preachy. It’s one of those books that makes you wish you were friends with the author, so you could call them up and talk to them what you thought. Have any of you read An Abundance of Katherines (John Green)? Parts of the book felt a lot like that. Maybe it was the format of “This woman – this experience – This ending”. Maybe it was the theme of teenage love. Or coming of age. So if you like reading John Green, you’ll probably enjoy this novel. After reading the book, I checked out Josh’s youtube channel and realized I recognized him from his “Doctor Who for Math Nerds” video. I watched a few vlogs and was shocked out how his voice is so recognizable from the book. it really is an honest novel, and he’s not trying to be anybody but himself. I’m not a man or an amputee, but I really related to this book. Wowza. We should hang out sometime! is quite accurately the best pickup line. Full disclosure, I’m probably going to use it in my future. Originally posted on The Adventures of Gap Year Girl, June 2014.